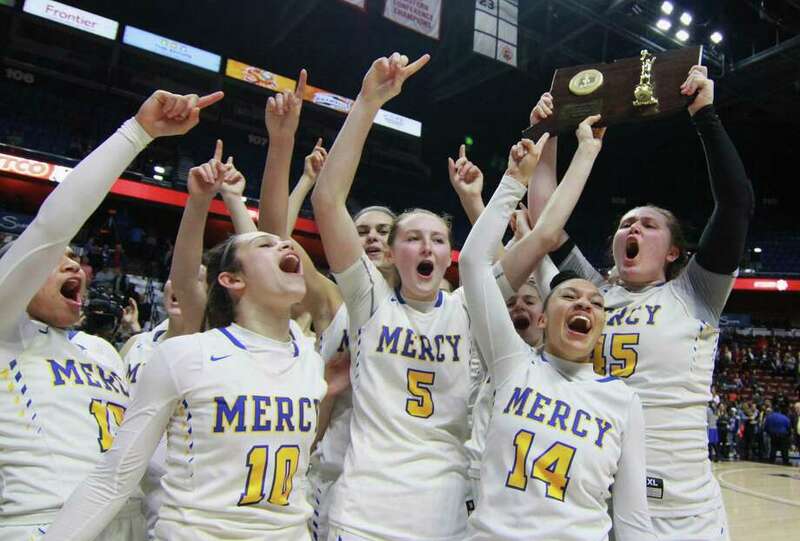 Mercy celebrates its win over Hall in Class LL Girls Basketball Championship action at Mohegan Sun Arena in Montville, Conn., on Saturday Mar. 17, 2018. UNCASVILLE—The first shots were not going down for the Mercy. Good thing for the Tigers they got two, three and sometimes four looks at the basket each trip down the floor, dominating on the offensive glass all night long in the CIAC Class LL state championship game. That tenacious work on the glass coupled with a smothering second-half defense propelled No. 2 Mercy to a 49-37 win over No. 5 Hall in the title game at Mohegan Sun Saturday night. This was Mercy second state championship after winning it all in 2013. Hall was seeking its first state title in its second appearance in a championship game but did not have any answers on the boards where it got out-rebounded 36-18. 17 of Mercy’s rebounds came on the offensive end. Mercy led by four at halftime and eight after three quarters but a 10-0 run in the middle of the fourth quarter put the game out of reach, pushing the lead to 45-28 with 2:20 left to play. Mercy held Hall to just 4 points in the third and 15 points in entire second half. Olivia Bonee led Hall with 9 points while Amber Raisner and Alexa Gellerman put in 7 apiece. Meghan DeVille scored 14 points and had 9 rebounds for Mercy and Alexa Leon pulled down 6 rebounds. Isabella Santoro, Mercy. Santoro put in 24 points while snagging 9 rebounds for the Tigers, 6 of which came on the offensive side. HALL (24-5) Amber Raisner 2 2-2 7 Alexa Gellerman 1 5-6 7 Madison Mandyck 2 0-0 4 Jenna Zydanowicz 2 0-0 4 Olivia Bonee 4 0-0 9 Olivia Delauriers 2 0-0 6 Siobhan Boyle 0 0-0 0 Jordan Farrell 0 0-0 0 Colleen Kennedy 0 0-0 0. Totals 13 7-8 37. MERCY (27-1) Isabella Santoro 8 8-12 24 Alexia Leon 0 0-0 0 Kameryn King 2 2-2 7 Samantha Chapps 2 0-0 4 Meghan DeVille 5 4-5 14 Jessica Carroll 0 0-0 0 Sammara Streater 0 0-0 0 Rachael Cipolla 0 0-0 0 Allesandra Fronc 0 0-0 0 Sophia Finkeldey 0 0-0 0 Vienna Knox 0 0-0 0 Nicole Bauman 0 0-0 0. Totals 17 14-19 49. 3-pointers: H — Delauriers 2, Raisner, Bonee; M — King. Bella Santoro is CT Gatorade girls basketball player of the year!